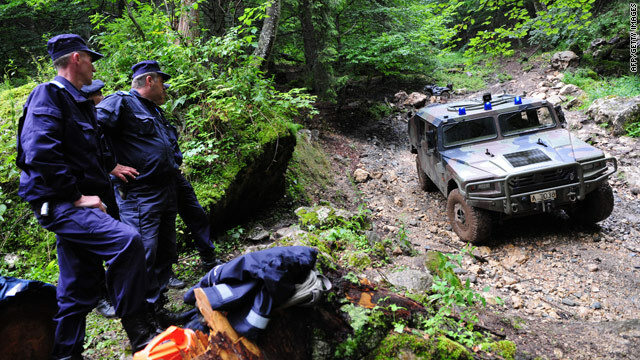 Romanian gendarmes secure the area on the Bucegi mountains on July 27, 2010 where a Israeli helicopter crashed on the 26th. Jerusalem (CNN) -- Israel has identified six military personnel who are missing after an Israeli helicopter crashed in Romania Monday during a joint military exercise. According to Israel Defense Forces, the Israelis included: Lt. Col. Avner Goldman, Lt. Col. Daniel Shipenbauer, Maj. Yahel Keshet, Maj. Lior Shai, Lt. Nir Lakrif and Sgt. 1st Class Oren Cohen. IDF said the aircraft was carrying four pilots, two mechanics and a member of the Romanian Air Force. The Israeli CH-53 helicopter went down about 3:20 p.m. (8:20 a.m. ET) Monday, the Romanian Defense ministry said in a statement. Search-and-rescue operations began immediately, using a Romanian medical helicopter and two Israeli helicopters, the statement said. The wreckage was found a few hours later in the Fundata-Zarnesti area, near Brasov in central Romania, the defense ministry said. The crash site was in a remote area at an altitude of more than 2,000 meters (about 6,560 feet) in the mountains, according to the ministry. Fog prevented helicopters from flying to the site Monday night. Defense Minister Gabriel Oprea has ordered a commission to the site to investigate the crash, the ministry said. The exercises, scheduled from July 18 through Thursday, are aimed at training low-altitude aircraft crews in search-and-rescue operations and medical evacuations, according to the statement. A CH-53 helicopter made an emergency landing July 18 after experiencing technical problems, the defense ministry said. The problem was fixed, and it took off and landed safely.